Acquiring your first 100k active users is an art, but a messy one—especially if you don’t have a lot of money to spend on marketing and paid acquisition. Winnie crossed this important milestone earlier this year, so I wanted to share some insights about how we did it, with a special focus on strategies that work for almost any product and cost no (or very little) money. Simply put, Winnie is a child care marketplace backed by a trusted community of parents. A lot of this information is crowdsourced, which makes Winnie a network-effect product — every user we acquire increases the value of the product to other users, primarily through the content they contribute but also through their engagement with other users. Products like this have certain natural advantages when it comes to growth, but they also have a tough uphill climb in the early days when they may suffer from empty room syndrome or lack the data that early adopters are seeking. So how do you get started when you have very few users and kickstart the flywheel that delivers long-term organic growth? Pre-launch startups often run a private beta with friends & family. This is a great practice, but it’s important to make sure that you have some growth mechanism for that beta, whether through invitations or simply making the beta public. Think about it—your goal with a beta is to test the effectiveness of the product, but shouldn’t the ability of that product to grow be one of the most important things to test? Winnie’s private beta grew from 10 to over 400 people in 3 months, driven almost entirely by invitations and personal referrals. Not only was this core group of early adopters extremely helpful to us, they also gave us confidence that this was a product people wanted and would grow on its own. It was very tempting to keep Winnie hyperlocal and just focus on one or two markets to start, but that approach cuts you off from a huge number of acquisition channels where you can’t target by locale (most notably for us, the App Stores). It’s also problematic to limit growth when one of the product theses is that it gets better the more people use it. So while we were ramping up for our v1 launch, we made the tough call to launch Winnie everywhere, even in regions where we had almost no data. We gave these users a different onboarding flow, where we allowed them to unlock the product by contributing reviews. 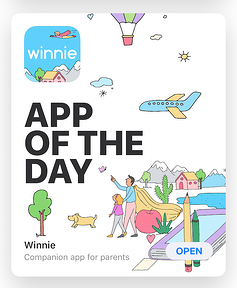 And it’s a good thing we did, because Apple featured Winnie on the front page of the App Store immediately after we launched. Without the Early Access flow, we would have been turning those users away at the door; instead, we used the opportunity to bootstrap valuable content. The Early Access flow from Winnie’s v1 launch. It’s very hard to grow if you don’t know how to position your product effectively. Luckily, we have the benefit of self-service advertising platforms — in particular Facebook and Google—to help you very efficiently test ideas and creative with different demographics. With even a very modest spend, you can try a ton of ideas and see what performs the best. This can also give you good data about what people are looking for. App store featuring is the closest thing we’ve had to “act of God” growth — it can give you a huge influx of new users, but you have little control over when it happens. That said, Winnie has been featured several times in both stores, largely due to the fact that we’ve done the work to make ourselves eligible and attractive for featuring. Ignore the siren song of “build once, deploy anywhere” and build native apps that are responsive, stable, and showcase the power of the platform. Both Apple & Google have extremely detailed design and UI guidelines — respect them. Invest in a unique and beautiful app icon, as well as striking promotional art assets. Incorporate platform integrations when you can, for example building in Apple Pay support when Apple is heavily promoting it on the store. Providing affordance for sharing your content or product is certainly important, but it turns out the way you frame that action can make a big difference in adoption. Early on, we had a Share button on every post, but noticed that it wasn’t getting a lot of usage. Instead, our users were asking us for ways to save posts to revisit later—along with an easy way to share those bookmarks with their spouses and partners. It occurred to us that some users may not see themselves as “sharers”, but nearly everyone uses a communication product of some kind to coordinate with friends and family. So we removed the Share button and replaced it with a Save button that then prompts you to share the post. This prompt is framed more around communication than around broadcasting the content, and it worked astonishingly well—social shares shot up over 300%. From the very beginning we imagined Winnie as a place where parents could not only connect with one another but with the child care providers and early educators that they rely upon to raise their children and care for their families. However, such a vision relies on the successful development of a two-sided ecosystem, an extremely daunting task for any startup with limited resources. Winnie’s (magical!) daycare & preschool search started as a data project and grew to be one of our best acquisition channels. While these are great for branding and can be a good way to cultivate a sense of community among your users, events are extremely time-consuming. Especially for a team of all engineers, the ROI was almost never worth it for us compared to larger-scale growth projects we could spend our time on. This was probably the biggest mistake we made early on. While we correctly sized up our target market (millennial parents) as heavy consumers of apps, when it comes to growth the web is still hugely important. These days the lion’s share of our organic growth comes from web traffic in the form of organic search, social shares and word of mouth. Mobile-first is great. Mobile-only is not. Another common mobile-first error here. It’s tempting to think that if you have an app installed on someone’s phone, it will be easy to reactivate them because you can use push to bring them back into the app. However, just because push is an option doesn’t mean you should neglect more traditional channels like email. Email is still very important — don’t neglect it! 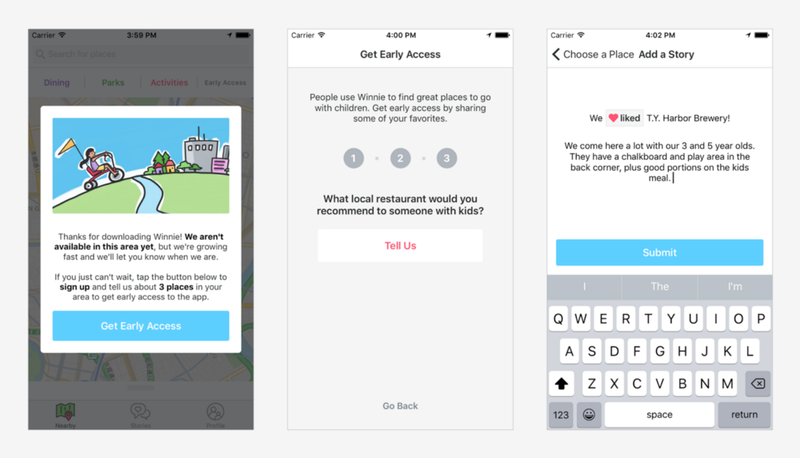 Winnie helps parents find daycares, preschools, and more. Get the free app for iOS & Android or visit us on the web. You can also follow us on Facebook, Twitter, Instagram and Pinterest.